Small business payroll can be completed by following six easy steps, starting by adding your first employee and ending when their paycheck is printed. It can be run manually or by using software to automate it. To help you, we’ll provide you with a free small business payroll checklist and the steps to follow. First, we’ll cover how to do payroll manually. This can be a difficult, however, so we’ll also provide a step-by-step example showing how to automate payroll with software, like Gusto, our recommended payroll software for small businesses. Click on the button below to start a free 30-day trial. Your business must be established before it can hire and pay employees. To do so, it must abide by federal labor laws, adhere to state requirements and set up accounts to pay taxes on behalf of employees. Once you’ve done that, you’re ready to do payroll. The following six steps will take you through what’s required to do payroll. The first step is only required once for each employee. 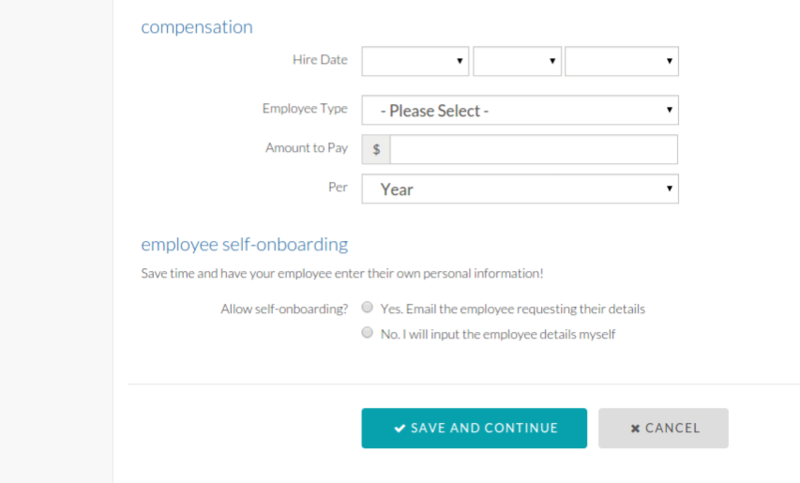 It allows you to set the employee up in your payroll system. 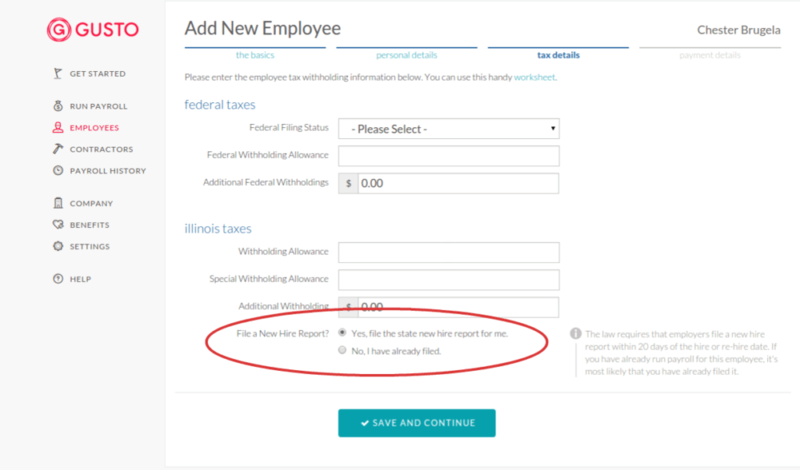 If you’re doing payroll for existing employees, and already have their data in your files, skip ahead to Step 2. Once your employee is ready to start work, you need to collect some important payroll documents. These include tax and work authorization forms, which the employees need to sign. The forms change slightly depending on whether you’re hiring W-2 employees or independent contract workers. If you’re not sure, read our article comparing W2 versus 1099 employees. For the purposes of this checklist, we’ll assume you’re hiring employees. You’ll use the data on the forms described below to add the employee to your HR or payroll system, if you have one. And, it’s a good idea to store this information in a paper or electronic personnel file as well. A W-4 is the federal tax withholding document that tells you what tax rate to use for the employee. Collect a signed federal W-4 form for tax withholding (available here). This does not need to be submitted to the IRS, but you should store it in a paper file or electronically in a personnel file (like Gusto provides). The state tax withholding document is similar to the federal and may be called by a different name in your state. Collect a signed state W-4 form for tax withholding (in some states only—check here) and store it in a paper personnel file or electronically. Collect a signed I-9 Form for work eligibility verification (within three days of the employee’s start date). You’ll want to make sure the employee can verify their identity and eligibility to work in the United States with a passport or two forms of identification. Register your employee in your state’s New Hire Reporting Program (within 20 days). A new requirement since 1996, you will want to make sure that you report all new or rehired employees to your state. Payroll software programs like Gusto often file these reports automatically. Get direct deposit information from the employee from a voided check (if applicable). For a more detailed rundown of these steps, including links to forms and other resources, check out our New Hire Checklist. This is a good time to make sure that your taxes and insurance are set up and that you’re compliant with labor laws, such as break time rules and overtime. You’ll also want to put up any required posters. Calculating hours worked is as simple as having the employee write down their start and end times each day and counting up the hours. Time taken for lunch is not counted in the total. Most businesses start out with a simple time sheet. As they grow, they often move up to a time and attendance system or time clock to manage employee schedules, break time and hours worked. Here’s an example of an electronic time sheet app from our recommend timekeeping vendor, Homebase. Straight time is the hours worked up to 40 hours a week (in most states). These hours are to be paid at the employee’s regular hourly pay rate, which can’t be less than minimum wage. For a state-by-state table on overtime and minimum wage, rates, read our article on running payroll. Overtime is calculated in most states as any hours worked over 40 in a week. However, in California, it’s calculated as any hours over eight worked in one day. Overtime rules can also vary by industry, such as home healthcare. Make sure you calculate overtime correctly based on your state’s requirements. Salaried employees may be paid a fixed salary based on standard hours (such as 30, 35 or 40) or a weekly pay rate, regardless of the actual hours worked. You may not need to track their hours. For easy to use time and attendance software that manages state overtime rules and also allows you to schedule your employees, consider using Homebase. It’s free. Homebase integrates with payroll software like Gusto, or accounting systems like QuickBooks to streamline your timekeeping. 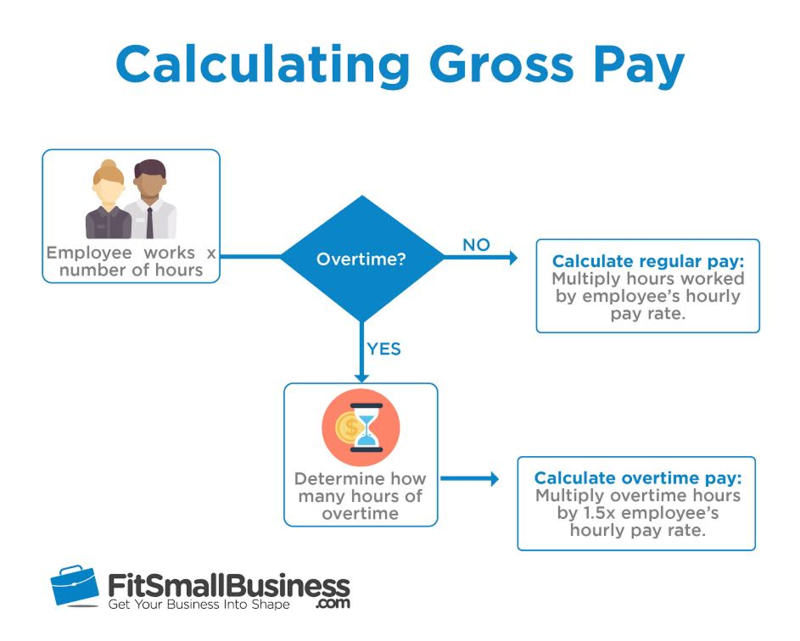 Calculating gross pay is as simple as adding up the straight time hours and multiplying by the employee’s hourly rate. Then, adding up the overtime hours worked in the pay period and applying the employee’s overtime pay rate to those hours. Straight time is paid at the employee’s regular pay rate, while overtime is calculated at 1.5 times the regular rate of pay. The results are added together to determine the employee’s gross pay. Example: Sam is a laborer who is paid $12/hour. Last week, he worked 44 hours. 40 hours of straight time are paid at $12/hour. That totals $480. Four hours are paid at 1.5 times that, or $18/hour. That totals $72. You can create a spreadsheet or time card calculator to do this manually, Or, use free time card software like Homebase to do the calculations for you. Doing payroll requires you know in advance what payroll deductions you’re going to make. Deductions include federal and state payroll taxes, benefits you might offer and things like unemployment insurance or Social Security. Here’s a list of potential deductions with links to more information, such as how to determine what to deduct for each employee. If you use payroll software like Gusto, deductions are processed automatically. To process those deductions, add up all the deductions for each employee to get a total, then subtract that total from the employee’s gross pay. Alternately, you can list each deduction as a line item and subtract them one by one from the employee’s gross pay until you come up with a net pay amount. Free payroll calculators let you input deductions as a separate line item, so you don’t have to do the math yourself. Most likely, you’re going to want to record employee deductions and payments by account within your general ledger accounting system. For example, there’s an add-on fee if you want to run payroll if you’re using QuickBooks for accounting. Or, you may want to hire an outside bookkeeper to manage these details for you. For more information, read our article on payroll accounting. Once you have subtracted deductions from the gross pay, you’ll have the net pay amount for each employee and be ready to pay them. The total is what each employee will receive on their check. At this point, you have a few options. 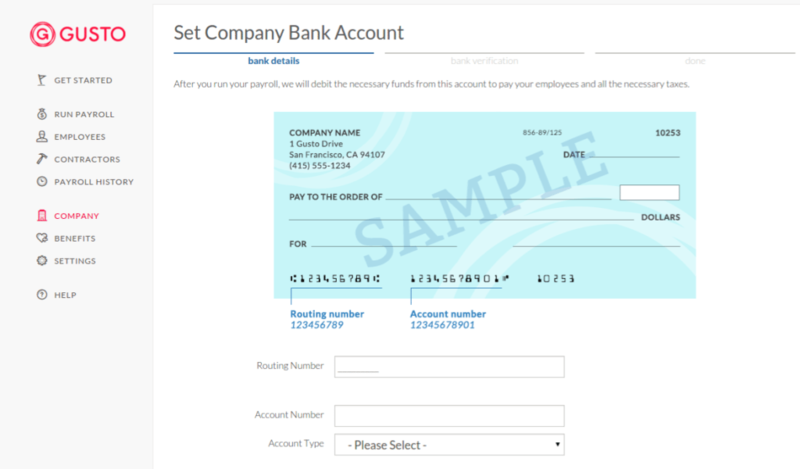 You can write checks manually using payroll checks that you can order, Or, you can print payroll checks and pay stubs by entering the data into a template. Either way, it’s a lot of manual work. The other thing you can do is provide employees with direct deposit or a paycard. Those options require you to upload data to your bank and set up (or obtain account information) for each employee. In the long run, this saves time. You’ll also need to determine whether you have enough funds in your payroll bank account. For options on funding your payroll account, read our article, Payroll Funding Options. Payroll software like Gusto can set up direct deposit for your employees. In addition, it provides them with a self-service option so they can see their pay stub online on via their mobile phone once payroll is processed. That saves you from having to give them copies of their pay stubs or year-end tax forms. They can use the mobile-optimized, self-service option to download these documents themselves. To remain compliant with federal labor laws, you’ll need to document specific data each pay period. Retain payroll documents like time cards, pay stubs and any information regarding pay increases. If you’re using software like Gusto, the documents are already online or can be uploaded and attached to the employee record. If you’re maintaining documents manually, you’ll want to ensure they’re stored securely. Payroll documents contain confidential information such as employee Social Security numbers. Alternatively, you can set up paper files, or upload documents to a document hosting service or your network. For more on payroll document requirements, read our article, Payroll Records: What to Keep and How Long to Keep Them. 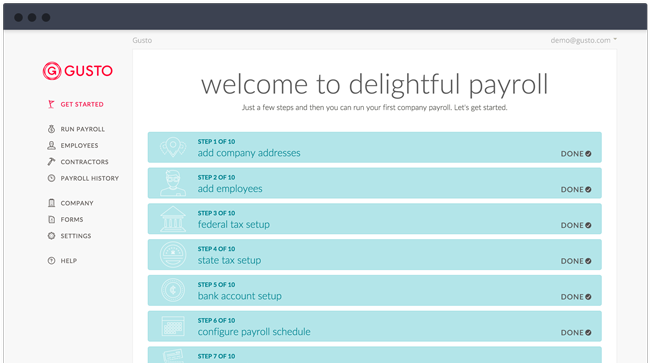 Next, we’ll show you how to set up payroll, using Gusto as an example. To follow along, you can sign up for a free one-month trial by clicking this link. Afterwards, the cost is $39/month plus $6 per employee. So for five employees, it would cost only $69 per month. You can estimate your price using their cost estimator. Note that these activities will include inputting your business information (EIN), tax information and bank account details as part of the setup. The setup of an online payroll system need be done only one time. After that, you can use the payroll software to do your payroll. Here’s how. Once you sign up for a Gusto account, you’ll be asked to add some basic company information, including your business address(es). This helps Gusto determine what specific forms you need for your state. If you have only one location, this will be easy. Payroll software providers typically guide you through the setup process. If you have trouble at any point in time, you can chat with a Gusto support representative. Just click the green question mark icon on the bottom-right corner of the screen when you are on their website and a chat window will open on the right side. Gusto reps use online chat to help you setup your free trial. You can also call their support team, or schedule a call for a future date and time if you have a tight schedule but still need to learn how to do payroll. What’s great about payroll software is you don’t need to know much about the tax rates. You add your physical business address and a few other details. Then, the system references the appropriate tax tables. For example, you’ll input federal and state tax information (if required), like your company type (LLC, S-Corp, etc.) and federal deposit schedule. If you’re unsure about any of these, Gusto will give you advice on the right side of the menu. They can even help you get an Employer Identification Number (EIN), if you do not have an EIN or TIN already. Gusto will link you to the IRS page where you can apply online. You’ll likely need to enter a State Employer ID number and a State Unemployment Tax (SUTA) Rate. As with the previous menu, Gusto will give you suggestions on what to enter and provide links to agencies, where needed. Here’s what one of the tax setup pages looks like. 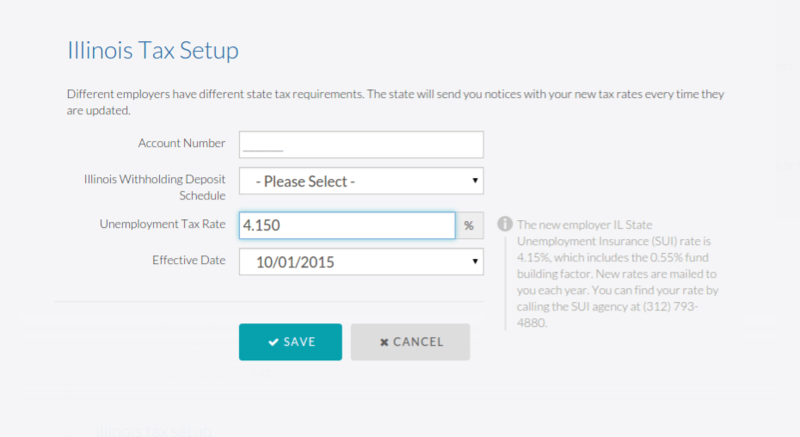 Gusto’s tax setup page example. Next, you’ll link your business bank account with Gusto. This is required so that Gusto can pay employees from your business payroll checking account and pay state and federal payroll taxes on your behalf. Enter your bank account and routing number. Gusto will make two small bank deposits (that will appear in a day or so) that you’ll enter into the system later on to verify your account. Need a business bank account? Read our article to learn which business checking account providers we recommend. Example of how Gusto gathers your bank account data. How frequently will you pay employees? When (day of the week or month) is your business’ payday? When will you run the first payroll? What work period will that first payroll cover? If your pay period runs from Sunday night at midnight to the next Sunday, you may want to pay one week in arrears starting each Friday. You’ll collect hours for the prior week and pay employees on Friday for the prior work week. Gusto has multiple pay schedules available. If you’re not sure how to answer these questions, read our article on the what and when of payroll processing. Or, reference Gusto’s pay schedule instructions. If you’re hiring your very first employee, there’s a good chance you also need to buy workers compensation insurance. Most states require it as soon as you add your first employee; coverage usually needs to start on your employee’s first day. To see what the requirements are in your state, check out this table from the National Federation of Independent Businesses (NFIB). Fortunately, you can sign up for workers comp insurance directly through Gusto. There’s no additional cost (besides the cost of insurance), and premiums will automatically be calculated and deducted each month from your business bank account. To sign up, go to the “Stay Compliant” tab, then click “I Need A New Policy.” From there, you’ll fill out some details about your business and employees to generate quotes. Their partner, AP Intego, should find you several different offers in your area. 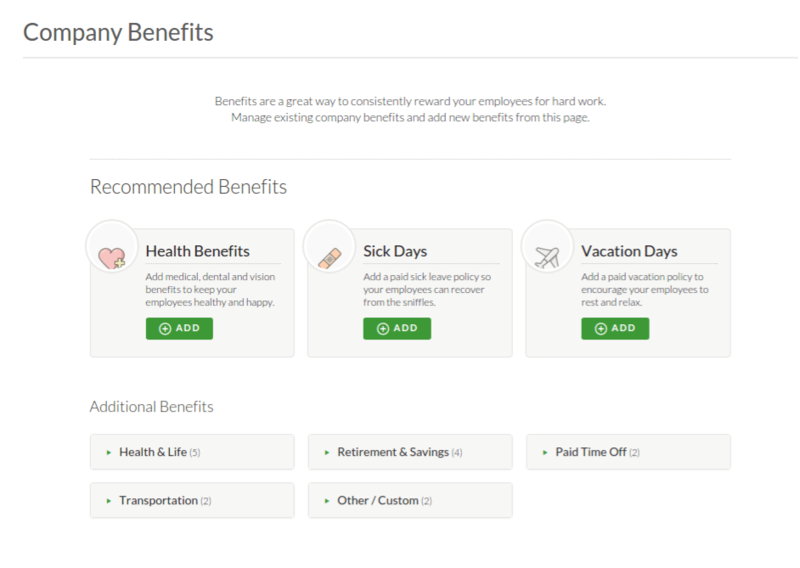 Gusto also lets you offer certain benefits to your employees. You can sign up to offer health insurance, retirement plans, transportation benefits, charity matching, and more. As with workers comp, payments for these are automatically calculated and deducted each pay cycle. Read more about Gusto’s benefits here. Gusto, as an insurance broker, can provide many employee benefit options. This gives Gusto approval to transfer money in and out of your bank account in order to pay employees and payroll taxes. Employees can register for direct deposit on their side of the process when they set up their profiles in Gusto. We recommend requiring direct deposit for all employees in order to avoid the hassles of paper checks and reliance on snail mail. This gives Gusto the authority to pay payroll taxes on your behalf. The Signatory option gives Gusto approval to access accounts on your behalf. To sign the forms, add yourself as the company signatory. 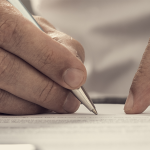 The signatory is the person at your business who has the authority to approve these forms, as well as future documents sent to the government (like payroll tax forms). Once entered, you can sign the forms electronically. 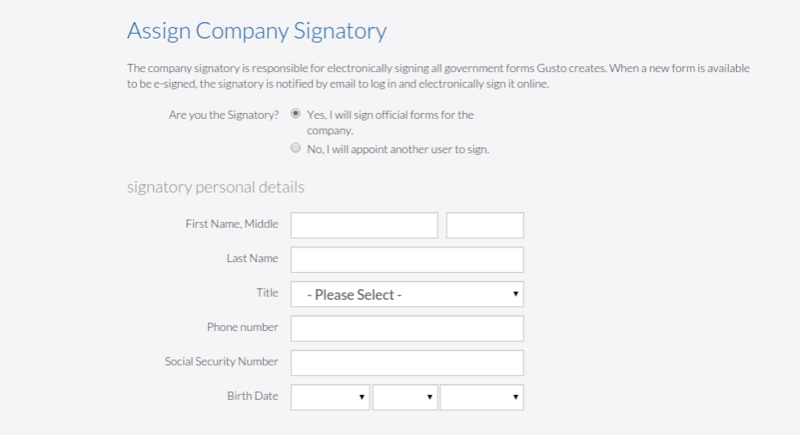 Gusto will notify you via email of any forms that need signing. Likewise, you can add your e-signature with a single click. Similar to adding your business information above, you’ll gather the employee’s information and add them to the system. You’ll start with some basic information, including their name, address, email, hire date, and salary/wage. If you are switching from a manual system to an online system, you may have to add several employees at once. The next step is to enter personal details, like Social Security number (SSN) and birth date, as well as tax withholding preferences. The employee should have indicated their tax withholding preferences on their W-4 form. 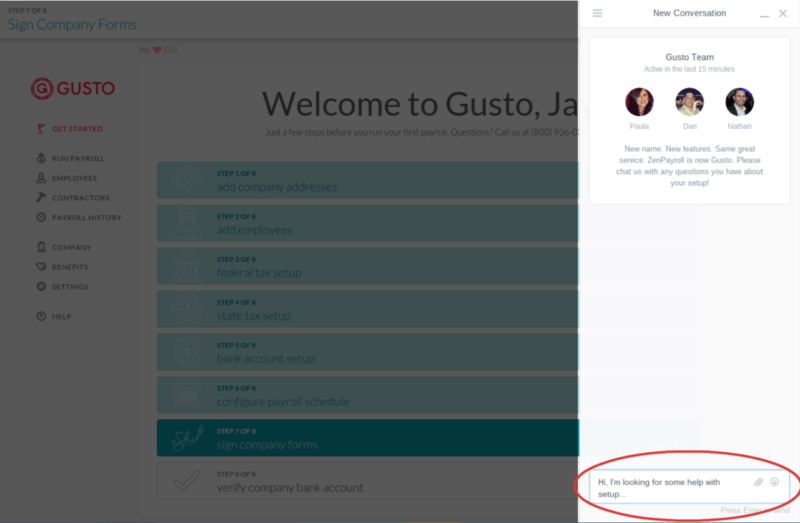 However, for new hires, we recommend using Gusto’s handy “employee self-onboarding” option. By selecting this option, employees will receive an email with a link to create their profiles and enter withholding and direct deposit information themselves. This is useful if you don’t have employees’ birthdays, tax forms, or SSNs on hand. You can input employee data manually, or have them do it for you with Gusto. At this stage, you can automatically file a New Hire Report. This is a notice you must send to your state office within 20 days of hiring a new employee. By selecting the option below, Gusto will automatically file the report with your proper state agency. Gusto can send new hire reports for you with one click. You will have two options to enter the hours the employee worked. You can manually enter the hours each pay period based on the employee’s time card, or you can use a timekeeping system, like Homebase. Simply import the hours worked from the time and attendance system into Gusto. Gusto interfaces with several of the top time tracking software systems. We recommend Homebase because it’s free for small businesses and provides timekeeping as well as employee scheduling and messaging—all in a mobile app. Using software, this run payroll task replaces Steps 3, 4 and 5 of the manual process above. Instead of manually calculating the employees hours, overtime and deductions, the software will do it for you. It will then provide you an estimate of the employee’s gross and net pay. You’ll also be able to see exactly how much money you’ll need in your payroll bank account to pay employees, giving you time to deposit money into that account. 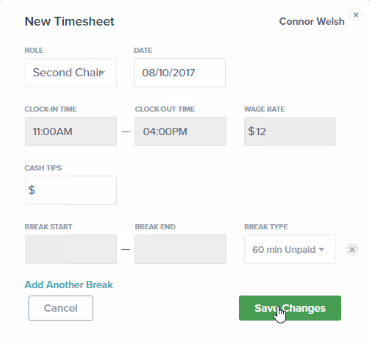 When you run payroll in Gusto, it lets you verify that you’ve input data correctly, haven’t forgotten anything (like bonuses, tips or uniform deductions) and haven’t made any major mistakes (such as keying in an extra zero). Here’s what it looks like to run payroll with Gusto. 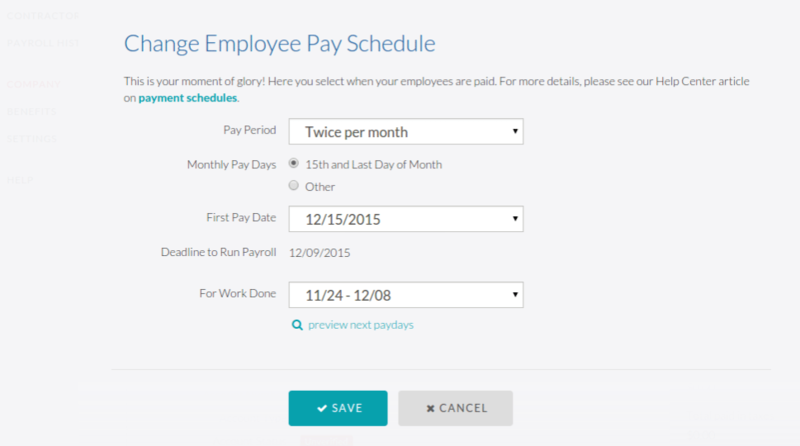 Gusto’s intuitive run payroll option lets you process payroll in seconds. Once you have gone through all of the payroll setup steps, whether it’s with Gusto, another payroll provider, or manually, the next step is to start using the program as it’s intended—for running payroll automatically. Most payroll software, including Gusto, have an option for “auto-pilot.” This means that every month, week, or two weeks, or whatever payroll schedule you set, it will automatically run payroll and distribute payments via direct deposit, or print checks. 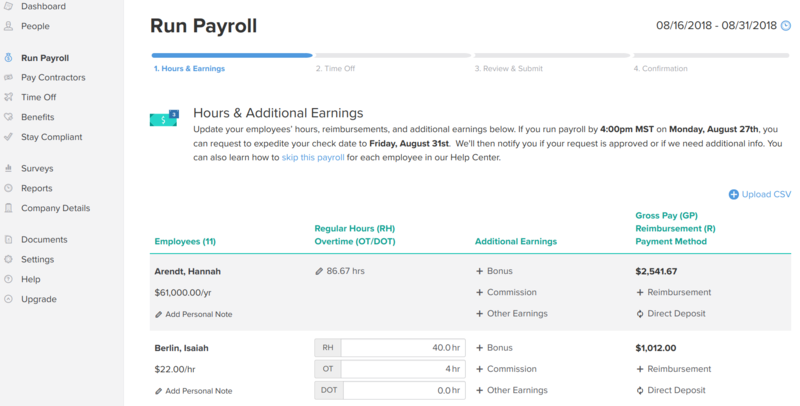 If you need to make adjustments, however, like adding hours, bonuses, commission, or sick days, you can do this very easily from the payroll menu. Most payroll software systems have an automated email reminding you of the adjustment deadline. For more information, read about running payroll on Gusto’s payroll help page. This step replaces Steps 5 and 6 in the manual process above because you no longer have to write out or print paychecks (unless you want to). Your employees will receive their pay by direct deposit instead. Because Gusto provides employee self-service, your employees will be able to see their paycheck stub online. Direct deposit saves you time and paper, and eliminates the risk of lost or damaged checks or employees having to leave work to run to the bank and deposit their paycheck. 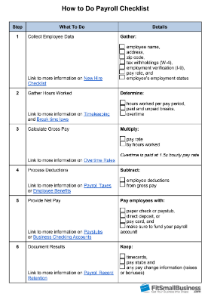 In addition, all your payroll documentation, such as pay stubs, are online. There’s no need to maintain paper files. Here are some questions small business owners may have about doing payroll. What Are the Risks of Doing Payroll Without Software? The biggest risk to your business is that you’ll make a mistake. Without a system to guide you, you may forget to pay taxes, collect deductions, or apply the correct overtime rate, as examples. 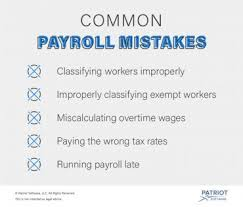 What Are the Most Common Mistakes Made When Doing Payroll? The most common mistakes are misclassifying employees and paying the wrong wages or taxes, according to software provider Patriot. To avoid these mistakes, we recommend you understand the difference between employees (W2) and contractors (1099), as well as exempt versus. non-exempt staff. Using payroll software will also eliminate many common payroll mistakes, as they have federal and state labor laws and tax rates built into the software. What Happens if I Make a Mistake Doing Payroll? The good news is that if you make a mistake in good faith, you can notify the employee and fix the mistake with no ramifications by providing retro pay. However, that doesn’t allow you to willingly violate labor practices, such as minimum wage, overtime or sick time pay. Those kinds of mistakes can cost big fines if you’re audited. Do educate yourself on labor laws and workplace requirements in your state and location to avoid as many mistakes as possible. Learning how to do payroll can be a pain. You have to make sure your business is registered with all the right agencies, fill out forms for each employee, and often purchase workers compensation coverage—all on a tight deadline (less than 20 days for most states by law!). Even a seasoned business owner can get overwhelmed when they want to learn how to do payroll. For most small business owners, we recommend using Gusto instead of trying to do payroll yourself. It not only makes employee onboarding much faster, but you have a huge burden lifted off your shoulders when it comes to calculating payroll taxes and sending them to the government, as well as purchasing workers compensation insurance, and more. Try it free for 30 days. But then instead of the info to set it up manually I am given directions on how to use Gusto 🙁 What happened to the manual directions?? Have you tried to go into the Employee profile to review the items that you have assigned to the employee? If not, I would go into the employee profile and click on the Payroll info tab. There you should find a list of earnings and deduction items that have been assigned to the employee. If there is one missing you can add it directly in that screen. If this does not resolve the issue, you should contact Intuit’s payroll support line at 1-888-333-3451. Our instructions for setting up payroll manually are at the top. You can also check out our New Hire Checklist for more detail on each of the 9 steps. Many of these steps vary depending on your state & particular business (such as SUTA and Worker’s Comp insurance), so we can’t provide exact directions. Our checklist (linked above), however, does give you links to the appropriate gov’t agency for each step. Well here is one article that screams paid endorsement. Not impressed with your obvious advertisement for a company that is out of the price range of most small business owners. Give us something to work with or don’t do it at all. We cover several different payroll systems here at Fit Small Business. 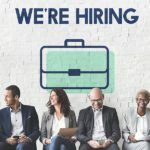 A more affordable option is Patriot Payroll (you can check out a comparison here), although using it does requires a little more manual work when it comes to filing taxes. While Gusto does have a higher price tag, they give a very high level of service – including full tax support, onboarding and benefits management. Similar service from ADP and Paychex are far more expensive for nearly identical features (check out a comparison we did here). Also, to answer how we make money, we cover this here on our website, which is also linked to at the bottom of every article. Totally agree with this comment by Josef and Jeremy’s smug response just confirms it. This article had the potential to capture a long time reader, but instead it will cause me to stay away from this site at all costs. I recommend other readers do the same (bad advice is worse than no advice at all). I’m sorry this article couldn’t be more helpful. We’re aware that Gusto is not the ideal solution for every small business, and this has since inspired us to write a guide on the Best Free & Low-Cost payroll software.